After weeks of frustratingly enigmatic teasers, Netflix finally released the first full-length “Jessica Jones“ trailer today. With the premiere now only a month away, fans have been anxiously waiting to see what the show is all about. Within the first few seconds of the trailer we can see it’s really dark. The trailer gives us a first look at Jones (Krysten Ritter), a wounded former superhero now just trying to get by as a private detective. Though we aren’t shown exactly why Jones gave up the superhero life, it becomes clear early in the trailer that she has a complicated and haunting past. We see her as she throws a guy face-first through her office door. (It’s exactly how her comic book, Alias, opens.) Then in a voiceover we hear her say, “a big part of the job is looking for the worst in people, turns out I excel at that,” followed by a glimpse at her powers (she can punch through walls, stop slow-moving cars, and execute high-flying leaps). Then she confides in Luke Cage (Mike Colter) and talks about her past with a man named Killgrave (David Tennant) — otherwise known as the Purple Man in the comics. From there, all hell breaks loose. Killgrave has the ability to control minds and has messed with Jones on more than one occasion. The trailer hints that maybe he forced her to do something terrible and as it turns out, Zebediah Killgrave isn’t quite out of her life — or her head — just yet. Netflix has planned Marvel’s “Jessica Jones” as the second of four epic live-action adventure series’ (“Daredevil,” which launched April 10th, “Luke Cage” and “Iron Fist,” all leading up to the teaming of the main characters in “The Defenders”) to premiere exclusively on Netflix. The first episode premiered at New York Comic-Con earlier this month, and, judging from the performances, the atmosphere, and the writing, the series has the potential to be as excellent as “Daredevil.” It already looks like it will be grittier. 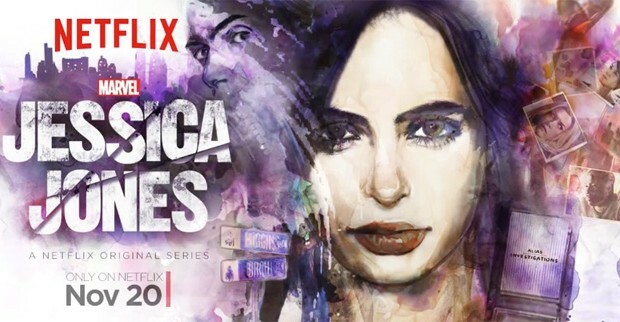 All 13 episodes of “Jessica Jones” will premiere on Netflix November 20.